The following is a transcript from Troy Taylor’s Ghostvillage.com Ghost Chat. Jeff_Belanger: Welcome to our special Ghost Chat with Troy Taylor, folks. Please be patient and wait until a question is answered before jumping in with your question. ghostlover: With my being a ghost hunter and all, what are the odds of getting caught going into a public place at night, when there is no trespassing? I’m thinking about something I had done a few months ago. Troy Taylor: It depends on the place and time, whether it was posted and whether you were seen. I never condone trespassing but occasionally it happens. Troy Taylor: Well, I can’t condone it, but sometimes there is no other way. I try to be respectful of the sites, especially cemeteries. ghostlover: Yeah, I can understand that. Jeff_Belanger: Troy, how old were you when you had your first ghost experience? Troy Taylor: I would have to say that I started investigating in the middle 80’s, so I was about 19 at the time. My first experiences did not come with the first investigations though. Jeff_Belanger: What was your first experience like? Troy Taylor: That was later on — probably around 21 or so. I was interested my whole life, but the first experience that I had was in a haunted building at the college that I was hoping to write about. I was told that people heard sounds from the past there and I wanted to check that out. I spent the night in the building with several friends and sure enough, around 1 AM we heard what seemed to be a person walking across the floor. It was an old gym at the college that was not used anymore. After we checked to make sure that it was not one of us (sometimes I investigate with some real goofballs — but in a good way), we turned on the lights. There was no one there but us — I think that was the first time. RON3002: Troy, did your parents (like most do) tell you as a child there was no such things as ghosts? ghostlover: If you knew a place was haunted, and you had asked permission to investigate, and you had to wait for so long, would you go instead of waiting? If you were really interested in checking this place out? Troy Taylor: Sometimes it is better to ask forgiveness than permission but only in situations where no one will get hurt. Jeff_Belanger: What are some of the biggest mistakes new ghost hunters make? Troy Taylor: My big thing is going on investigations without knowing how equipments works that’s one. 2. running around cemeteries with a camera — doing NO research and calling it ghost hunting. 3. believing the hype about digital cameras. That’s a good start and sure to always make someone mad. Jeff_Belanger: Can you talk more about digital cameras? Troy Taylor: Oh boy — here we go. ghostlover: The ghost hunting group I’m with out here in Virginia, they tell me that its bad to try to take pictures with a digital camera, cause of the pixels. Troy Taylor: Plus, they cannot be duplicated — because of that, and here’s the reason that is the big thing for me, digital images cannot be offered as evidence in a court of law — so why should they be used as evidence in something as tough to prove as the hunt for real ghosts and real evidence of the paranormal? The orb-a-philes, as one of my AGS reps call them are everywhere! RON3002: My group uses digital cameras for preliminary research purposes like getting the lay of the land and points of interest for the formal investigation. ghostlover: It makes them feel special and good in my opinion. They think that when they do take pictures with digitals, that they can actually prove there is life after death. Troy Taylor: My problem is when they are the only cameras being used, that’s all. secretsign: What’ s your take on all the Orbs pictures? Troy Taylor: I have a real problem with orbs and you might have seen the article about it on my website, but while I do think there are some legitimate orbs out there — there are so many that are not. Even the real ones though — what actual proof do we have that they are ghosts? Troy Taylor: Are they paranormal, yes? (The legit ones anyway) But are they ghosts, who can say for sure? Michael: What is your take on EVP? secretsign: I know their like a everyday piece of business in ghost pictures. Troy Taylor: EVP? fascinating but tough to prove that it’s legit. We only have the word of the researcher that they are real and while that may be good enough for us, what about the public? RON3002: Troy, do you have a favorite film type, as in B&W or Infrared? Troy Taylor: Nothing like loading a camera in total blackness, huh? raventlynn: What do you think about motion sensors in an investigation? raventlynn: That is my next expense. Do you have a particular model that you prefer? Troy Taylor: I have used several kinds, including Radio Shack (which are okay but not great). A friend hooked me up with the ones that we sell on our site and I can’t think of the name, but I think that it’s Room Guardian. They work really well. Jeff_Belanger: What other equipment is essential to ghost hunting? Troy Taylor: They are inexpensive and easy to use. RON3002: It’s ok until we get better funding. raventlynn: I love my EVP recorder… I rely on that more than my digital camera. I never have an investigation in which I don’t get something on one or the other! Troy Taylor: funny thing about equipment — I like to use it, but is it ever really essential? That’s the real argument that people have. Remember that none of it was made to actually hunt “ghosts” — it has all been adapted. RON3002: I like having a night scope for use (am a bit clumsy). Troy Taylor: Because of this, we have to be careful with the information that we get from it and how we use it. I often tell people that its tough to prove a haunting scientifically through equipment. Ghosts do not perform on command. I tend to use historical research and witness interviews for a lot of my groundwork. raventlynn: This is so true… I never get anywhere if I ask them to tell me something… they do seem to have their own will. Troy Taylor: If two people have lived in a house during a separate period and have no connection to one another and yet have the same experiences — not knowing that anyone else has had them, then — hey, you just proved historically that the house was haunted! Troy Taylor: screaming like a little girl with a buddy of mine while in a haunted place… want more info? Troy Taylor: We were in a haunted and abandoned hospital and saw a figure walk across a doorway at the end of the hall. We knew that no one was there but us. We both let out a scream and grabbed one another — this is funnier if you know us. He is a Harley Rider and I am not a small guy. ghostlover: Sounds like it was. Troy Taylor: We were both decked out in leather. Travis__CK: Isn’t it great to be so close to your fellow investigators? raventlynn: Talk about it much to people? fullmoon: This would not have been at Waverly, would it, Troy? raventlynn: Sounds a little embarrassing. RON3002: I almost became a ghost “thanks to heart attack” brought on by a little kitty cat jumping out of a cupboard. Troy Taylor: Nope, not embarrassed a bit. Just one of many experiences. Jeff_Belanger: Troy, do you consider yourself psychic or sensitive to spirit energy? Troy Taylor: No — psychic as a fence post. Jeff_Belanger: Me too — maybe even less so if that’s possible. Troy Taylor: Although I knew you would ask me that — ha! ghostlover: how often do you use psychics on your investigations? raventlynn: I have had a spirit follow me from a home that was haunted and has stayed with me for many years…do you see this often? Troy Taylor: Not too much — but we do have a ghost who lives in our store in Alton that came home with me. It’s a long story but in short, the place as haunted — allegedly by a little boy. raventlynn: I lived in this house for years before he attached himself to me! Troy Taylor: Once we had a baby at home, weird things started happening there and nothing had before. Troy Taylor: “He” or whatever, seems to like the baby, especially her toys. Things play by themselves, toys start up on their own, toys vanish and come back. My wife is not too sure about it, but I think it’s pretty cool. RON3002: Troy do you believe children are more “in tuned” to the paranormal due to lack of corruption of their minds? Troy Taylor: Yes — animals too — which doesn’t say much about kids but I think we should take “imaginary friends” a lot more seriously than we do. Travis__CK: Troy, may I ask why you hunt ghosts in the first place? What got you started? Troy Taylor: Something I was always fascinated with. I got started because of a love of the unexplained. People always want me to say that my mother died and came back to haunt me but it was nothing like that. ghostlover: When I went out for the first time on a ghost hunt, I ended up having a few soldier ghosts attach to me. I hear a drummer every night. I went to North Carolina once, and it followed me to there, while I was staying in a hotel room. How can you get rid of ghosts that attach to you? I still here the drummer every night. My husband has heard him, but he passes it off as someone playing their stereo too loudly. raventlynn: Ghostlover asked an interesting question…psychics….do you believe in them and do you use them? Troy Taylor: There are ways to get rid of ghosts and psychics are one use, BUT I have trouble finding legit psychics. I do not use them in investigations but in some cases they work when they are good ones. I have one good one in Illinois and one in PA. That covers the east and west but I am hoping to find others. I know there must be some out there. RON3002: Troy, what’s your standing on Ouija boards? Troy Taylor: people can create “ghosts” — have you heard of the “Phillip” case in Canada? raventlynn: I have heard of this,…something to do with the mind over matter? Troy Taylor: a group of researchers created a ghost and “he” took on a personality and began causing phenomena to occur. They actually did it with their own minds — like PK in a human agent poltergeist case. raventlynn: Sorry…I thought you were talking about a different type of created ghost. raventlynn: That’s an interesting story. Jeff_Belanger: You’ve written a lot about ghosts of Illinois, what’s one of the more harrowing sites you’ve investigated in the state? Troy Taylor: The most haunted — bachelor’s grove — my favorite ghost? Resurrection Mary. Jeff_Belanger: Is resurrection Mary in Chicago? raventlynn: I love that story! It is one of my favorites! ghostlover: I can say haven’t seen her. I wanted to go there once, but was afraid I would get lost. Troy Taylor: Yes, she haunts Archer Avenue on the south side. Jeff_Belanger: Have you ever seen her personally? raventlynn: ghostlover…you are like me…I can handle anything supernatural… but don’t get me lost on the road! Troy Taylor: One of the only vanishing hitchhiker stories with real names, people and places behind it. No, I have not seen her but would I like to pick her up, yes! fullmoon: Troy, do you think that a portal exist at archer avenue?? Troy Taylor: No, not really but I do think the area has something to it — a mystery about it that the Indians recognized when they turned it into a trail. It is surrounded by water, which helps to make it more haunted. RON3002: Troy your standing on Gettysburg, True or mostly media hype? Troy Taylor: True — look at the violence and death — I have investigated it many times and have spent many days and evenings there and have had some strange experiences. I heard sounds, smells, myself and a friend had a “horse” or the sound and smell of one come up right behind us and we both experienced it at the same time. RON3002: Has anyone heard of Agawan rock, or the Bridgewater Triangle? Troy Taylor: I am familiar with the triangle — any truth to that or lots of coincidences? What do you think? RON3002: I use to “party” there in my younger days, weirdest thing I saw was a huge water rat. Guest: What do you know of Dudleytown in Connecticut? Troy Taylor: I hear lots of stories of strange disappearances in the triangle but wondered if there was anything to it. Areas like that fascinate me. 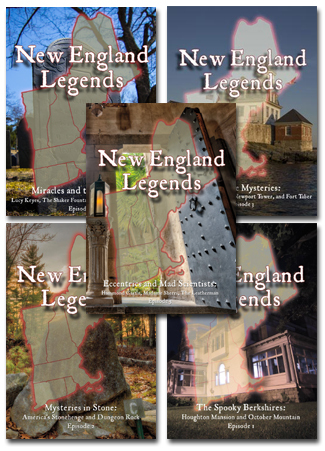 ghostlover: where is Bridgewater triangle at? Troy Taylor: Jeff is the expert on Dudleytown here — want to jump in? Jeff_Belanger: I’ve been to Dudleytown 4 or 5 times over the years. RON3002: Actually a pretty dangerous place (quick sand). raventlynn: Guess I won’t be moving there! ghostlover: So its cursed so to speak then? Troy Taylor: I would say that “odd” only scratched the surface but is the luck really bad — the curse I mean — or part of the legend. Any opinions? Jeff_Belanger: They built a small town on rocky soil, in the shadow of three mountains. They never really had a chance. Troy Taylor: good point Jeff — it’s not an area for farming. ghostlover: I think that maybe its the way things had been disturbed or some kind of an imbalance in the earth in that one area. Jeff_Belanger: There is a lot of talk of a curse — it certainly holds a lot of intrigue. raventlynn: Wonder why people live there? Jeff_Belanger: In the early 1900s a wealthy doctor turned it into a nature preserve so he and his friends had an escape from New York City. The cellar holes and some trails remain today. Travis__CK: Troy this question has come up many times. Can a ghost make physical contact with you, as in touching you? Troy Taylor: Physical contact? Yes — I have had it happen. I have been touched on a couple of investigations. I have had my clothing tugged on here in our haunted place more than once. raventlynn: In my home…the last one…where there had been a murder…my husband and my baby both woke up with scratches on them! secretsign: Troy do you have any investigations in the works now? Troy Taylor: I don’t have anything in the works now — I am leaving on vacation at the end of the week. RON3002: Troy, ever been on a investigation anywhere near Massachusetts? raventlynn: I have had a lot of physical manifestations… violently swinging plants… baby swing shoved sideways… sort of angry! Troy Taylor: I have visited Massachusetts because my sister lived there for a while. I visited haunted places, but no actual investigations. Jeff_Belanger: Troy, do you have any thoughts on residual hauntings? Could a traumatic event like the battle at Gettysburg leave a psychic impression on the area for centuries? Troy Taylor: I think so — we call this a haunting but its more of a “memory” I think than anything else. Violent or repetitive events leave an impression on the atmosphere and re-play like a movie. raventlynn: I agree with that about the memories! Jeff_Belanger: Troy, do you delineate between “ghost” and “spirit”? Troy Taylor: I like “ghost” as a generic term. I think of spirits as interactive, traditional and intelligent ghosts. I think of ‘apparitions’ as residual effects but everyone has their own usage I think. fullmoonlvl: Troy if you had to take only one piece of equipment on an investigation what would it be? Troy Taylor: A notebook and pen — and a camera — okay that’s three. raventlynn: Do you take notes, then, on paper as opposed to recording your findings? Travis__CK: Can you speculate on why a residual haunting that has been going on for years will just seem to stop? Troy Taylor: They fade out as the energy dies out over time. A residual is just energy that has been left behind. Jeff_Belanger: Troy, do you ever try to perform a clearing of an unwanted spirit? raventlynn: Can a spirit act on YOUR emotions? Troy Taylor: No, I do not, Jeff, but I have a couple of good people who can. I was skeptical of the process until I saw it work. Troy Taylor: Can it act on your emotions? I don’t see why not, especially if we are talking about an interactive ghost and intelligent spirit. raventlynn: I was curious….mine seems to react to my anger at times… or if something has happened to me… he would destroy things or throw things! Troy Taylor: have you considered that some of the happenings may be your own outwardly directed energy? raventlynn: That was told to me! Jeff_Belanger: Folks, we’re just about out of time. Does anyone have a last question for Troy Taylor? secretsign: Any new book on the way? raventlynn: Thanks for the information, Troy! It was very nice meeting you! Troy Taylor: Several , ha ha! Right now, I have a new edition of my book on Haunted Alton — then one on researching haunted cemeteries. fullmoonlvl: Jeff and Troy I have enjoyed the time tonight. I hope Troy will do this again. Troy keep the books coming. Jeff_Belanger: I’d like to thank you all for coming by, and I’d especially like to thank Troy for spending this chat with us. What a great guest! ghostlover: Thanks, Troy, you helped me out a lot. Troy Taylor: Take care everybody and thanks again! Troy Taylor has left the room.